From Book One, Chapter 1, p. 3 this quotation sets us up for the many ways Nabokov makes references and allusions to other novels and artists. These allusions are so frequent it is almost impossible to keep up with them. This is an example of what many critics call meta-fiction in which a novel is foregrounds the fact that the novel is written, that it is in fact a work of fiction. All works of art refer to other works of art. This is inevitable since it is impossible to even think without referring to other thoughts, most of which are not our own. 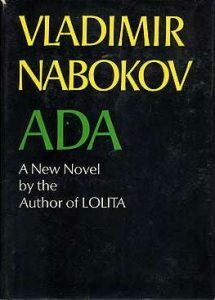 In a work like Ada, which clearly makes use of the idea of meta-fiction, other literary works are referenced quite consciously in order to draw attention to fictive aspect of life itself. The translation of the name of Tolstoy’s book is also a kind of literary joke (an accurate translation would have been “Childhood and Adolescence”). In a sense, this novel tells a story in order to show us that we are all telling our own story. To that end, life is a more or less plausible fiction. This is from Book One, Chapter 12, p. 79. The casual denial of the importance of the relationship between Van and Ada is an ironic statement, one which runs counter to the tremendous significance of the tangle of incestuous relationships of which they partake. Something of the Proustian narrator seems to intervene here to present an ironic commentary on the central relationship in the novel. This quotation concludes Part 4 and Van’s long discourse “The Texture of Time.” The quotation ends in mid-sentence and in doing, it points us back to the beginning of the novel. As if to enact the very thing “The Texture of Time” describes, this short quotation reveals so much of the theme of time throughout the novel. Events transpire, circumstances interrupt narrative flow, and relationships circle back to their beginnings as the novel endlessly interrogates the idea of time while it constantly drives home the relentless passage of time. This is a central quotation which exemplifies the brilliance of Nabokov’s work. He distills the grand themes of time and space into a sentence fragment while he also subverts the theme by sending us back to the beginning of the narrative.